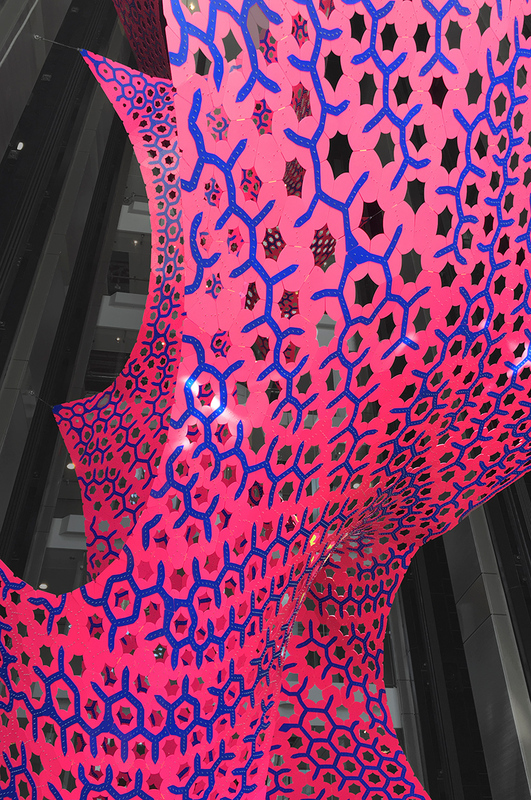 MARC FORNES / THEVERYMANY has installed a 120 foot-tall fluorescent pink aluminum architectural sculpture within the world’s largest cruise ship. 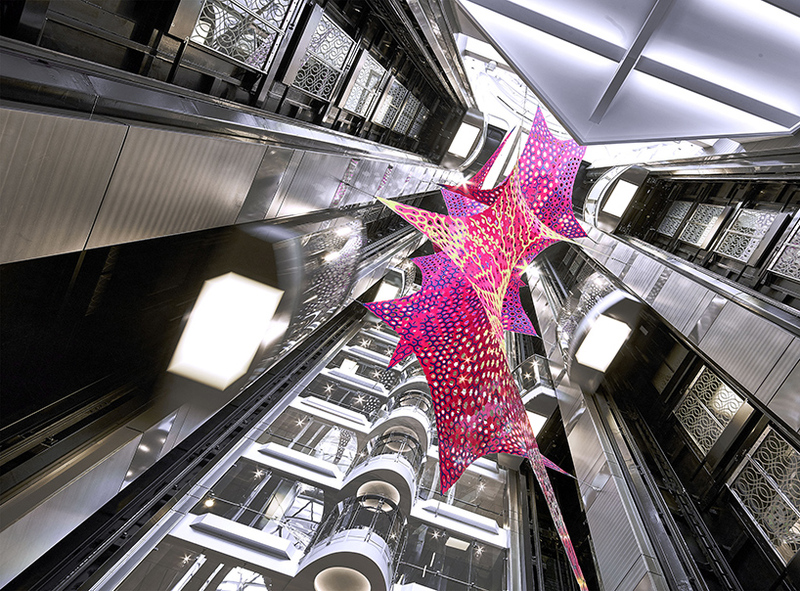 comprising 10,813 painted aluminum parts, 44,700 rivets, and 23 anchor points, ‘tour de force(s)’ has been situated in one of two lobbies that form the ship’s complete cross-section, where six elevator bays rise over 16 decks, and several flows of people converge. at three times the size of the titanic, royal caribbean’s harmony of the seas forms a temporary home for up to 5,400 people at any one time. 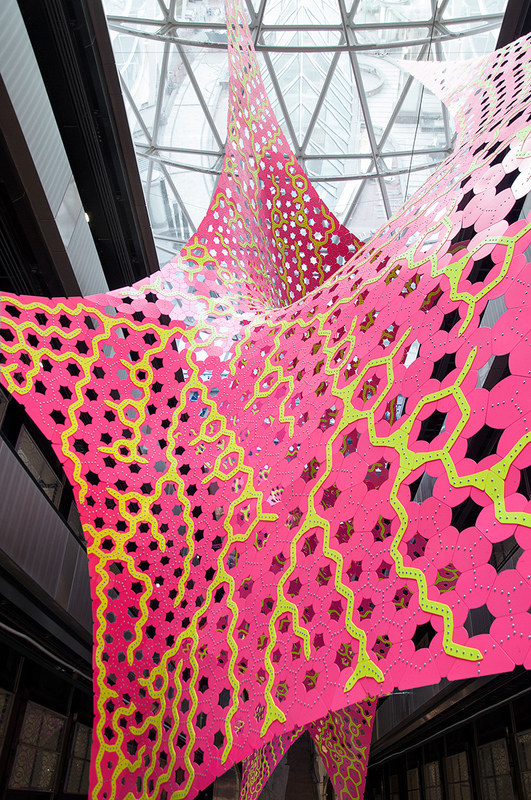 the permanent installation, designed by MARC FORNES / THEVERYMANY, offers a variety of experiences depending on where it is viewed from — looking up while waiting for the elevator; looking out from a contemplative position on any of the decks above; or as a dynamic view from inside an elevator as it either lifts or lowers. 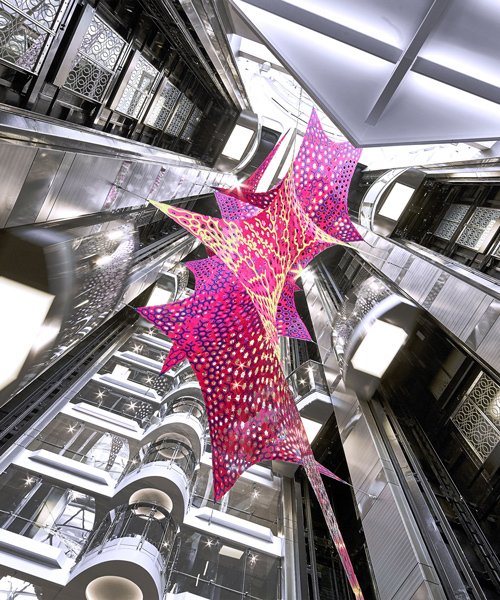 according to the design team, the piece has the same objective as the cruise vacation itself: to remove a person from his or her familiar, everyday life, and place them somewhere out of the ordinary. 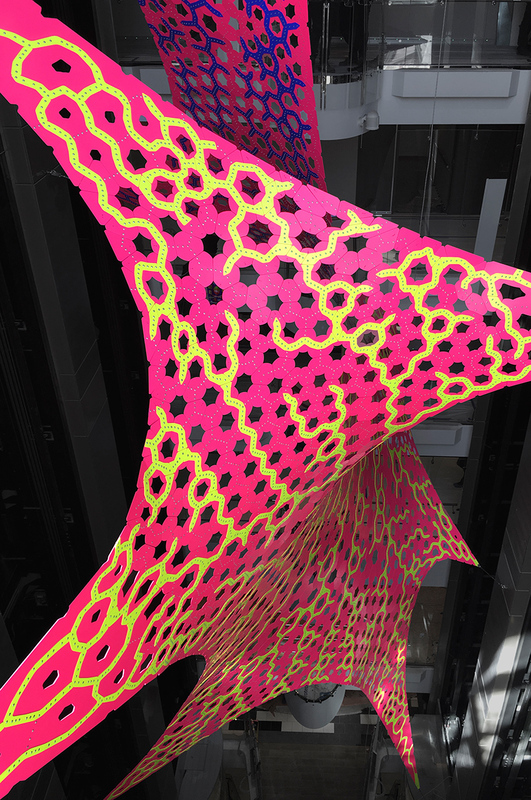 the florescent pink surface is adorned with organically-formed yellow and blue trails that each have a different type of behavior. 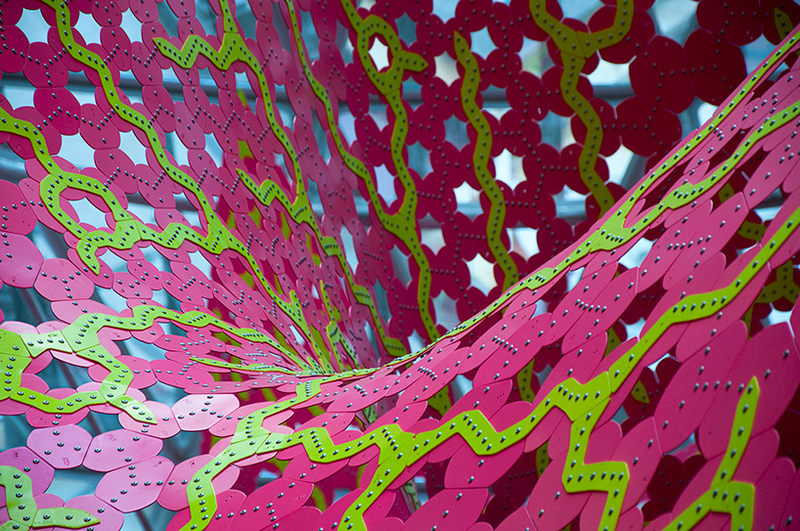 all three colors create a composite multi-layer system, which — due to the slight give between parts — is able to assume the described double curvature without the need for cold bending or folds. 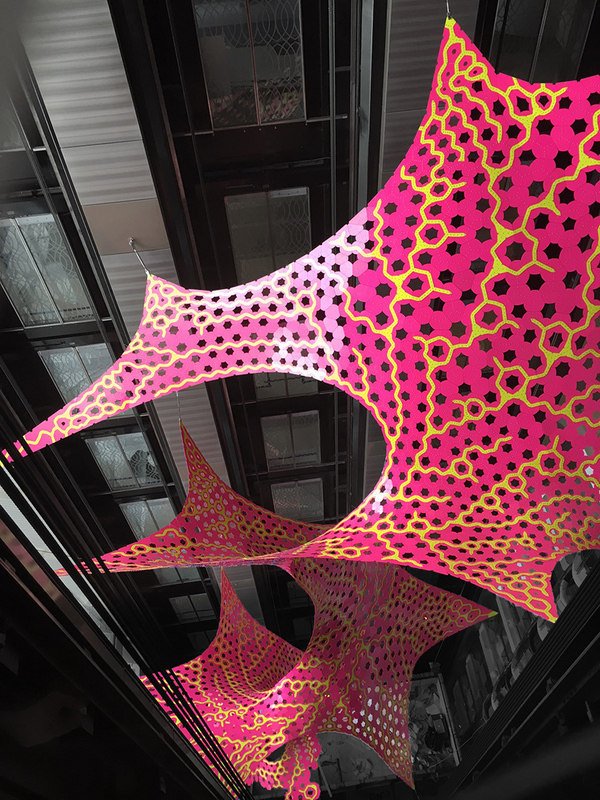 the finish includes an application of powder-coating to provide resistance to corrosion, a second layer of liquid paint, and last, a layer of transparent varnish for the protection. 1978 called, they want their Roller Disco mobile back.